Together the mischievous Raven and the peaceful Eagle bring balance, magic and creativity to the world. 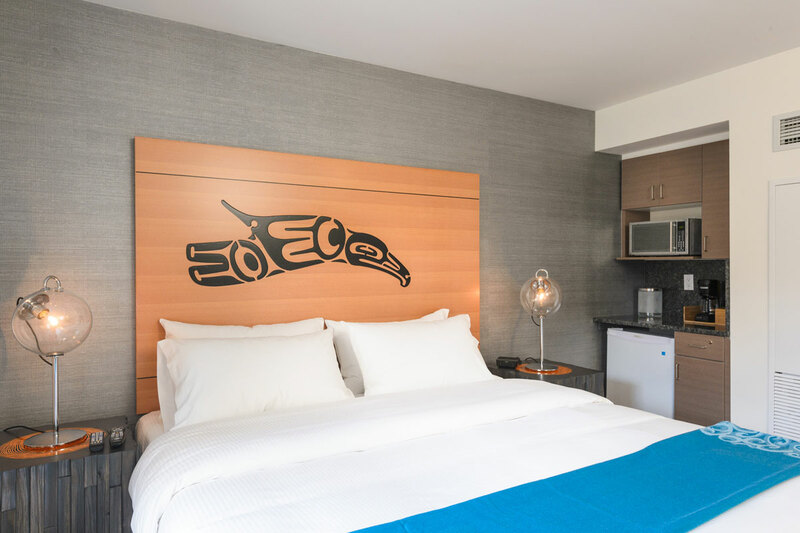 The image of the Raven, soaring across the headboard, and the Eagle, winking down playfully from its perch, were chosen by artist Corrine Hunt to represent the Air Suite. The Raven demonstrates both virtuous and mischievous tendencies. Unafraid to take risks, Hunt recognizes the Raven as a problem solver, a characteristic she feels is lacking in today’s society. By incorporating the Raven into the design of the Air Suite, Hunt aims to convey the importance of adopting this attitude when addressing issues. The Eagle symbolizes peace and denotes the need for living in harmony with one another. The Eagle is depicted winking, which adds lightness to this message and expresses that achieving a state of peace involves openness and gaiety. Incorporated into the body of both hummingbirds is the motif of a whale’s tale. 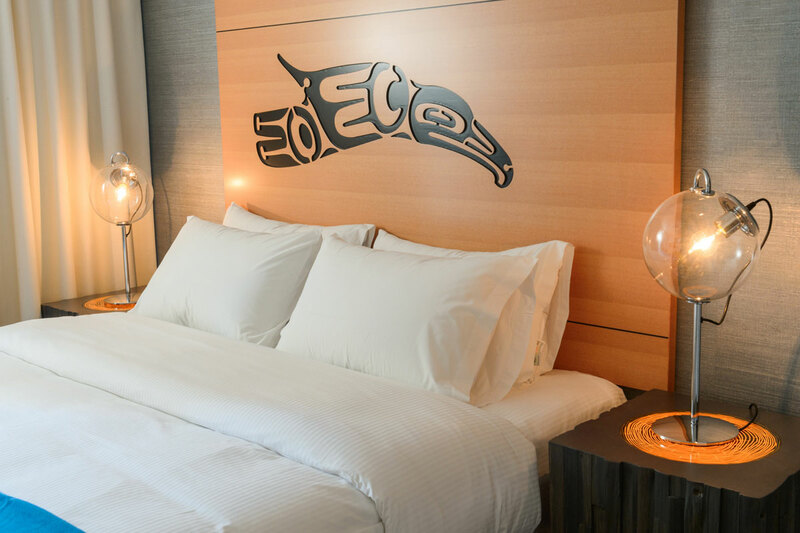 Eagle down is traditionally used in smudging ceremonies to cleanse a space and spread peace around a room. This cultural practice makes the Eagle an appropriate figure to represent peace. Invoking traditional mythology and incorporating inspirational narratives of her own, Corrine Hunt gives voice to important social messages through her artworks in the Air Suite. 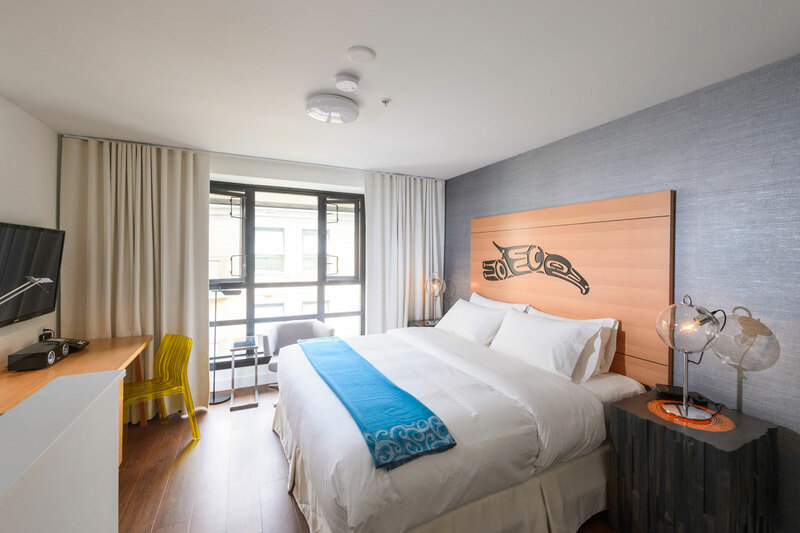 Whether salty from the sea or perfumed by the fragrant pines of BC’s vast forests, the air of the Pacific Northwest Coast has a distinct freshness, which BBA Design aimed to capture in their creation of the Air Suite. 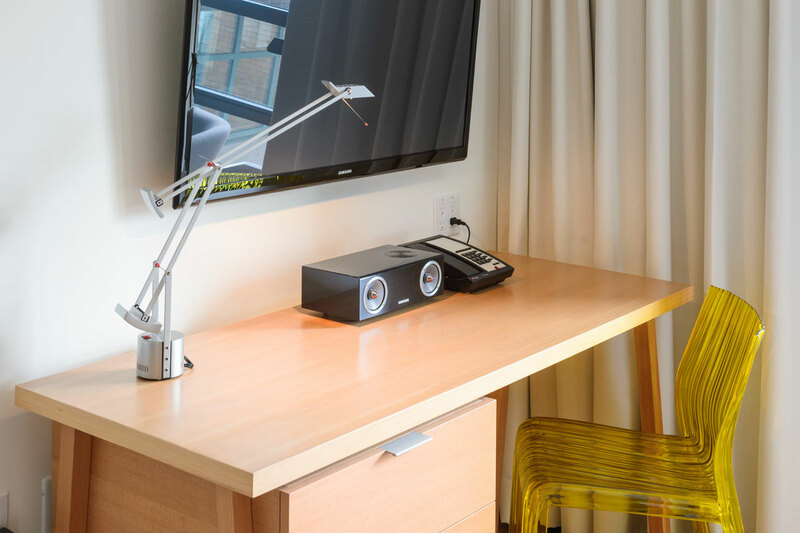 Crisp white linens, circular glass lamps, a clear yellow desk chair and minimalist décor are light and rejuvenating. 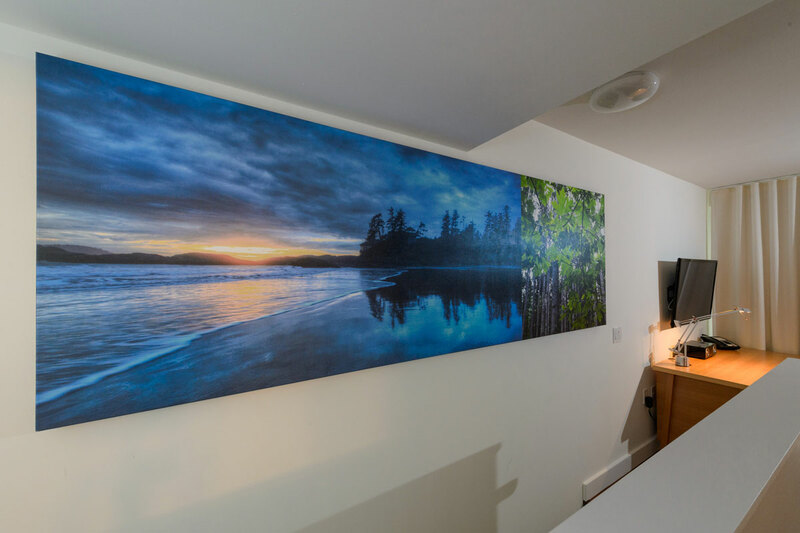 While the soft grey headboard wall, rich turquoise accents and artist Corrine Hunt’s featured artworks add warmth and interest. Her raven and eagle artworks stand out against the clean aesthetic, which focuses attention on the messages she means to convey through them. During the day the suite evokes an energizing aura and in the evening the glass lamps cast an enchanting glow about the suite – like the twinkle of stars – creating a restful space. 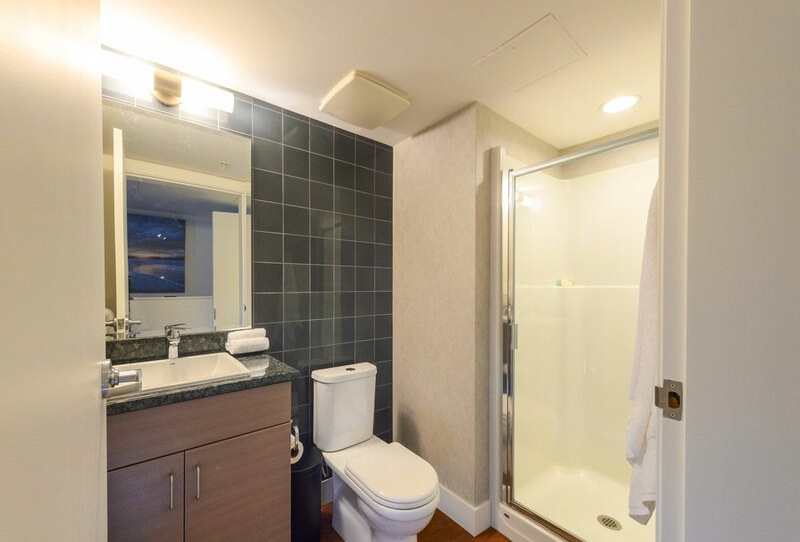 This balanced design scheme aptly represents the element air, while also creating a comfortable guest environment.